Chamos Anti-Wrinkle Cream Review (2018) : Worth Buying? What Is Chamos Acaci Snail Repair Anti-Wrinkle Cream? provide your skin with the nutrients it needs to stay young. elevate moisture levels to keep it supple. repair damages on skin matrix. Skin mucus has been observed to help fight signs of skin aging. It repairs damaged skin, facilitates exfoliation, and regulates oil which, in turn, protects your skin from infection, blemishes and breakouts. By rebuilding skin, skin becomes more resilient to damage and surface water loss is minimized. Although there are limited reviews online to back its claim and effectiveness. 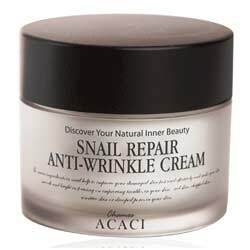 What Are The Ingredients In Chamos Acaci Snail Repair Anti-Wrinkle Cream? Musin (snail mucus extract), beneficial skin ingredients that include the hydrating elastin, skin conditioning Alantoin, exfoliating Gluconic Acid, and anti-inflammatory Chondroitin sulfate. Copper tripeptide-1 and Centella asiatica extract, facilitate wound healing and promote protein synthesis. Butylene Glycol: This ingredient is a colorless organic alcohol used as a solvent and as a conditioning agent. Cleanse and tone skin before applying a generous amount of Chamos Acaci Snail Repair Anti-Wrinkle Cream on face, neck and decollete. It is recommended for twice daily use for best results. This product helps to bring about a soft, moisturized feel on skin. This product protects the skin from free radical. This product helps regenerates damaged tissue. Although there are no reviews online to back this claim. Contains perfume and other potentially irritating ingredients which makes this product not suitable for very sensitive skin types. Studies to support long-term product claims have yet to be made available. Research on the anti-wrinkle benefits of snail mucus is still relatively young. There are limited reviews available online to prove its effectiveness. While products such as the Chamos Acaci Snail Repair Anti-Wrinkle Cream are a refreshing addition to the otherwise monotonous rhythm of anti-wrinkle creams that are merely riding on the latest bandwagon, these creams’ claims are relatively difficult to evaluate as well.